Bonnie Pilon documented the history and reach of nurse-managed clinics in the U.S., visiting 82 of them during her sabbatical. Photo by Daniel Dubois. Bonnie Pilon, Ph.D., FAAN, knows and loves nurse-managed clinics so much she took a year off to visit as many as possible. 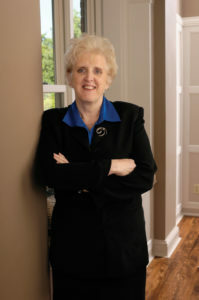 Pilon, now Professor of Nursing, Emerita, opened and oversaw nurse-operated clinics for the Vanderbilt University School of Nursing for 15 years as senior associate dean. In 2015, she took a sabbatical year to research the history and culture of nurse-managed clinics nationwide. She visited 22 organizations from Alaska to Florida to get a better idea of the landscape of nurse practitioner-managed health centers. “I tried very hard to get a diverse sample,” she said. Those clinics operate 82 sites, five of which are rural, 20 urban, 20 suburban and one on the Alaska frontier at the Dahl Memorial Clinic in Skagway, a town of less than 1,000 people. “There are no doctors in the whole region,” Pilon said. “If you get hit by a car, or a moose, you go there.” The location is very remote from other medical facilities: six hours by ferry to Juneau, Alaska, or three to four hours by ambulance to Whitehorse in Canada’s Yukon Territory. Her mission took her to clinics like the Prescott Health Clinic in Arizona, which serves those without access to primary care due to no insurance, high-deductible plans or shortage of primary care physicians. The 82 sites Pilon observed serve more than 65,000 unduplicated patients with more than 270,000 visits per year. In 62 sites, the target populations are uninsured, Medicaid recipients, high-deductible health plan participants and low-income patients, often with chronic illnesses. Fourteen of the sites target employees and dependents. Pilon came to a number of conclusions, which she presented in September at the Ninth International Council of Nurses Conference in Hong Kong. Her overall finding: “Nurse-managed health centers have a major impact on individual health and the health of communities,” she said. She found that the centers and practices are often, but not exclusively, associated with schools of nursing. However, there is no complete database of nurse-practitioner-managed sites nor any repository of their work or outcomes. All sites, whether nonprofit or for-profit, are mission-driven. Financing is a constant challenge for the sites, as payers often discriminate against nurse providers. State nurse practice laws pose additional logistical and financial burdens, she said. This entry was posted on Thursday, June 29th, 2017 at 6:39 pm	and is filed under Issue, News, Summer 2017, Vanderbilt Nurse News. You can follow any responses to this entry through the RSS 2.0 feed. Both comments and pings are currently closed.